See the orginal post on Chessbase India here. Rucha Pujari had hit a plateau, the Women International Master title was so close yet so far. During the hunt to complete the requirements, she faced various technical difficulties. Determined to play best chess possible, she took part in both the Aeroflot Open B and C categories this year (only player to do so). She persevered in spite of tough opposition and successfully completed all the requirements. In this interview, Rucha tells us about the backstory of becoming a WIM and her immediate goals. I was invited to conduct a Chess Coaching Camp in Nagpur from 7th - 13th July 2016. It was great to interact with upcoming players and share my knowledge with them. Those were the seven days packed with chess, learning and fun. Looking back, presenting here the report of the camp. Writing for this post feels difficult, because thinking about how much my mother has been a part of my chess career and life, my words will be inadequate. Still I will try, because she has made me believe that nothing is impossible for me if I try. Chess. I have been playing this game for many years now, and in this article I would like to throw light on the benefits that I have got by playing and studying this beautiful game. What does Chess give you? Lots. The list is long. It improves our memory, concentration and imagination. It tremendously helps in decision-making. Learning this game helps us in other areas of our life. Practical studies have shown that children who play Chess do very well in academics. I strongly recommend everyone to learn Chess and understand at least the basics. One point I would like to add is that, one need not play Chess professionally in future, but just learning the game for the sake of the benefits is worth it. Spending time on Chess is like investing in our brain. Just like we need exercise for our body, we do require exercise for our minds to remain fit. Beautiful Puzzles - My first eBook is now available on Amazon! As I walked into 2016, the year seems to have started well for me as my first ebook got released. I can call myself an author now that ‘Beautiful Puzzles’ is available on Amazon! After months of work, and going through a lot of chess games, the book is finally here. Personally, I admire the artistic aspects of Chess. With this interest in mind, I started exploring and going through hundreds of games – mostly recent ones in search of aesthetics. The positions are completely new and ideas, fresh. Presenting in this book 150 hand-picked chess combinations for you to solve and admire. Making Chess easy to learn! As I started teaching kids who are new to Chess, I felt that maybe it takes some time for them to understand how all the pieces move. 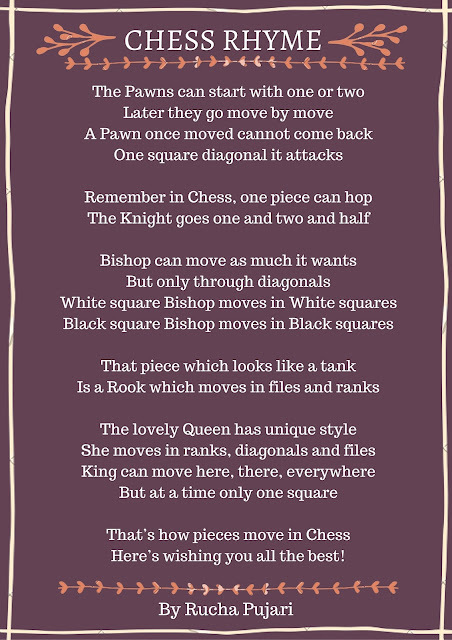 So, I have composed a rhyme to make it easier to remember for anyone who is trying to learn the Chess moves. It also has a tune! After the success and good response for the first event of Ruchess academy, we organized a second Friendly Rapid Open Chess Tournament on 10th Oct 2015. It was a great event with many interesting games being played. Sharing some of the moments here through pictures. We play and follow Chess regularly. It's a beautiful game. How about taking some time to know the World Champions from history to today of this brilliant mind game? These World Championship matches are held by FIDE which is the World Federation of Chess. There are in total just sixteen Champions till today! The first official World Chess Championship Match was held in 1886. Here we shall see the World Champions in chronological order. Let us go back in time. Our mind is a wonderful thing. With our mind it is possible to create a world we want to imagine. This idea inspired me to express my imagination through a poem. In just few words is it possible to travel to far away lands and just admire the beauty of nature? Winning a tournament... for the sixth time! 22nd May 2015 was a good day for me as I won the Women's Open Rating Tournament at Sangli. It is always a wonderful feeling to win a tournament. It is the glorious moment of all the hard work and preparation. But what's more special is that this is the sixth time that I am winning this tournament! So here I have decided to bring together the winning moments, and the pictures with the beautiful rolling trophy from all these years. "How is this event different from your regular events?" a reporter asked me. "Well, in a tournament I play against one opponent, but today I am playing against 38 players at a time!" I replied. "How will this event help you?" "Such events are generally organized to spread and publicize the game of Chess. They are exhibition events and thus reach a greater audience. Different players get the opportunity to participate, enjoy the game and display their skills. Personally it gives me satisfaction that I can play against many players at a time. The resulting confidence and motivation will also help me in my career." It was the summer of 2014 and I was playing in a simultaneous chess exhibition event in Kolhapur. How was the event and what is simultaneous event in Chess? Read on to find out. Solving different studies is a very enjoyable thing for chess players. Setting up the pieces on the board or computer, and then thinking for an infinite period of time! I do have my share of such experiences when it took me hours, sometimes even days to find out the solution for a single composed study. But it's a thrill to take on such challenges and there is always beauty in the answers. Recently, I came across a study which I would like to share with you. It's a very beautiful composition, so try to solve, and then compare your analysis! Chessbase is one of the most popular Chess websites. As a regular reader and follower of their website, I was delighted when I received an opportunity to write on their platform. On 20th February 2015, my first article was published on Chessbase. It is a review of the Chess DVD My Path to the Top by Vladimir Kramnik. The battle between Viswanathan Anand and Magnus Carlsen for the WORLD CHESS CHAMPIONSHIP title will begin from 7th November 2014 in Russia. Will Anand add a sixth World Championship title to his career or will Carlsen defend? Many questions, many predictions... It is not just the two players, but the entire world, that will join in the action and excitement. Before the games begin, here's all you need to know about the upcoming World Chess Championship Match. Remember that moment when after hours of hard work, you stopped the clock just to ask the arbiter for an extra Queen? Or that moment when you promoted all the pawns even though you were winning already? Well, this is a humorous poem on Pawn promotion. Enjoy. It was around six thirty in the evening. I was attending a very big event in Kolhapur - Satej Youth Fest. I found myself sitting in the row of chairs with a sign next to it, which read 'Achievers.' The sun was setting slowly and the colorful lights seem to shine more brighter. The music was getting louder and the atmosphere was getting fun. Everyone moved along with the music beats which the DJ had specially selected for this day. The event was being attended by thousands of people, mostly college students. I sat there watching the beautiful dances and there were many more performances in the agenda. But the main attraction was something else. Indian TV Serials: where the story goes from somewhere to nowhere! This is the only place where a person takes ten minutes, literally, to walk down the staircase. This is the place where a person says his thoughts aloud, even in solitude. This is the place where the music can appear from no-where, even if the shot is set in a dungeon. This is the place where people wear designer clothes, put two kilos of make-up & fight on trivial issues. This is the place where the problems that the characters are facing, are just too fancy for us, the mere mortals to even imagine. Welcome to the world of Indian Television Serials. Most of us regard creativity as something that involves aesthetic sensibility, art or a creative insight. When we see a beautiful Chess combination or a piece of art, in that case, we wonder how someone can produce something so good from scratch. But that is a limited definition of creativity. We can think creatively as well!! Dreams are meant to be fulfilled. Stories are meant to be told. Feelings are meant to be felt. Words are meant to be spoken. And thoughts are meant to be expressed.